The San Francisco Estuary Institute-Aquatic Science Center is pleased to announce the publication of its latest report, Sacramento-San Joaquin Delta Historical Ecology Investigation: Exploring Pattern and Process. The report is the culmination of several years of research synthesizing thousands of pieces of historical evidence with contemporary scientific understanding. The report provides new information about how the Delta functioned to provide habitat for native species and includes dozens of rarely seen historical accounts, maps, and photographs. For more information, please see today's press release. 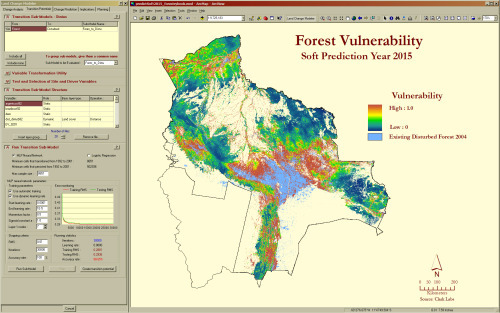 The report and Geographic Information System (GIS) data are available for download here. Printed copies of the report will be available in several weeks, at a cost of $75 each (plus tax/shipping). 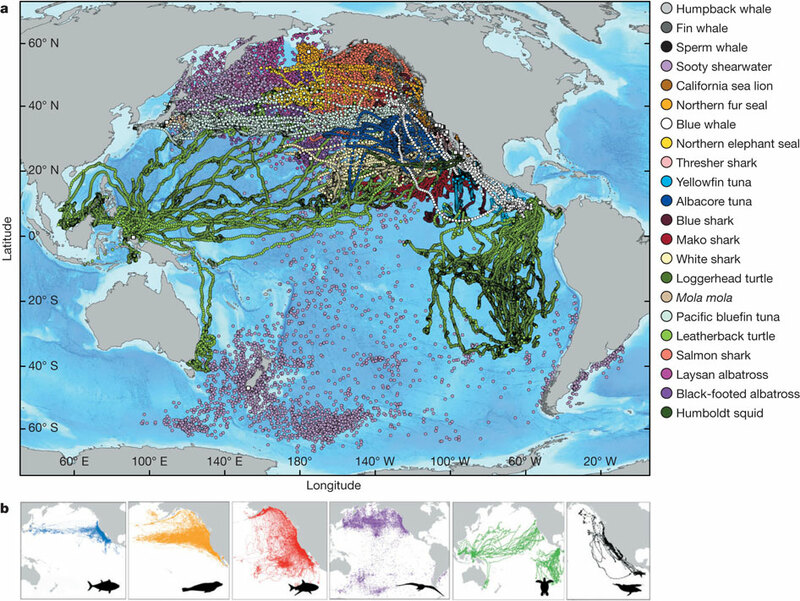 From a new Nature article focusing on the tracking of marin predators in the Pacific. What a cool graphic! a, Daily mean position estimates (circles) and annual median deployment locations (white squares) of all tagged species. b, Daily mean position estimates of the major TOPP guilds (from left): tunas (yellowfin, bluefin and albacore), pinnipeds (northern elephant seals, California sea lions and northern fur seals), sharks (salmon, white, blue, common thresher and mako), seabirds (Laysan and black-footed albatrosses and sooty shearwaters), sea turtles (leatherback and loggerhead) and cetaceans (blue, fin, sperm and humpback whales). Leafsnap is the first in a series of electronic field guides being developed by researchers from Columbia University, theUniversity of Maryland, and the Smithsonian Institution. This free mobile app uses visual recognition software to help identify tree species from photographs of their leaves. 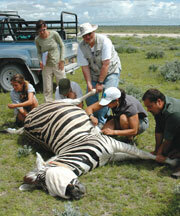 Collaring a zebraA very nice article about Wayne Getz's research in Africa: spatial ecology, epidemiology, conservation and citizen science. From Breakthroughs Magazine. In this article he talks about his evolution as a scientist from mathematician to geo-nerd. The article states: At the core of Getz’s work is how and why animals move across the land. People have sought answers to these questions for time immemorial - at first to improve success in the hunt and harvest, and much later to understand animals in and of themselves. His approach combines a mathematician’s genius for analysis with hands-on wildlife research. This unique perspective is revealing that animal travel patterns can provide a great number of insights into animal behavior, ecology, and epidemiology. And now the GIS part: In recent years, the advent of global positioning system technologies, coupled with expanded telecommunications networks, have added up to a revolution in animal tracking. The modern version of the radio collar can map an animal’s position to within a couple of meters every few minutes, upload the stored data automatically to a satellite or cell phone network, and allow biologists to track the beast from afar for many weeks. Also read about his work in education and social justice in South Africa. Cool stuff. Check it. James A. Johnstone and Tod Dawson's recent paper in PNAS show that California's coastal fog has decreased significantly over the past 100 years, potentially endangering coast redwood trees dependent on cool, humid summers. Coast redwoods, Sequoia sempervirens, grow in a narrow coastal band, from Big Sur to Oregon, characterized by cool summer temperatures and high humidity from fog (see map at right from USGS). 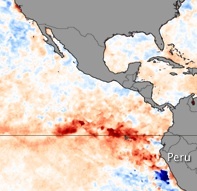 They analyzed 20th century climate station records, and have shown that since 1901, the average number of hours of fog along the coast in summer has dropped from 56 percent to 42 percent, which is a loss of about three hours per day. Excerpted here. From GreenInfo Network. 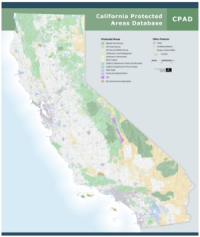 The new California Protected Areas Database (CPAD 1.4) has just been released in geodatabase and shape file formats. 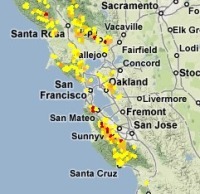 Please visit www.calands.org to download. Updates and improvements to CPAD are described in the CPAD Manual also available on the CALands web site. WHAT'S NEW IN CPAD 1.4: CPAD 1.4 contains a number of important data improvements - more coverage of urban parks, more complete alignment to parcels, broader implementation of management designations, and more. VIEW CPAD DATA ONLINE, REPORT ISSUES: For those who do not use GIS or prefer to view CPAD via the web, you can do so though a google map overlay at http://www.calands.org/review.php. We welcome input from the CPAD user community to keep us informed about errors and updates in CPAD. Please report errors by clicking on the "Report Error" button. After setting out (yellow line) the birds pause in the North Atlantic (red circle) to feed. Going home (orange line), they follow the winds.We still might not know the air-speed velocity of an unladen swallow, but now we know the daily flight distance (up to 500km!) of the tiny arctic tern. Reported in the BBC. Starting in August and September, the small (3.5oz) bird will head from Greenland and fly to the Weddell Sea, on the shores of Antarctica. It will spend about four or five months in the deep south before heading back to the far north, arriving home in May or June. A team from Greenland, Denmark, the US, the UK and Iceland attached small (0.05oz) geolocating archival light loggers to the birds' legs to find out exactly where they went on this polar round trip. The devices do not rely on satellite navigation, but record light intensity. This gives an estimate of the local day length, and the times of sunrise and sunset; and from this information it is possible to work out a geographical position of the birds. They banded 50 birds in July 2007 in Greenland, and one year later collected the devices from 10 birds (more birds with loggers were seen in the colony, but these could not be recaptured). More on these cool devices here. More info on these amazing birds here. 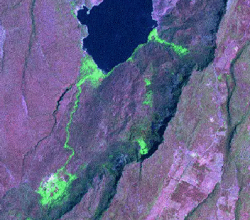 A bit late, but a good source of wetland mapping information from the the GlobWetland Symposium: Looking Lake Bogoria in Kenya, Landsatat wetlands from space. The GlobWetland project was launched in 2003 with the aim of developing and demonstrating earth observation-based information services to support wetland managers and national authorities worldwide in responding to the requirements agreed under the Convention. The project involved 50 different wetlands in 21 countries and relied on the direct collaboration of several regional, national and local conservation authorities and wetland managers. It has now produced a number of standardised information products (e.g. land use and land cover maps, change-detection maps, water cycle regime maps and others) validated over the 50 selected sites by the users themselves, consolidated methods and guidelines for the users to continue the work after the project lifetime. The GlobWetland Symposium was held in October 2006 in Frascati, Italy to inform the general public and policy makers of the importance of wetlands and to promote their conservation and protection worldwide. The papers in this special issue highlight the major points and recommendations derived from the Symposium while the ﬁnal conclusions provide a basis for initiating new actions within the ESA in support of the EO requirements of the Ramsar Convention and the wetlands community. The special issue in Journal of Environmental Management from the conference has many interesting papers on wetlands mapping. From SF Gate: Because of climate changes in the next few decades, the changes in bird habitats and behavior between now and 2070 will equal the evolutionary and adaptive shifts that normally occur over tens of thousands of years, according to researchers with PRBO, also known as the Point Reyes Bird Observatory. "What we found is that not only will species shift and communities change, but the composition of communities in certain places will not resemble anything we see today," said Diana Stralberg, a landscape ecologist and the lead author of the report, "Reshuffling of Species With Climate Disruption: A No-Analog Future for California Birds?" published in PLOS. From the abstract: By facilitating independent shifts in species’ distributions, climate disruption may result in the rapid development of novel species assemblages that challenge the capacity of species to co-exist and adapt. 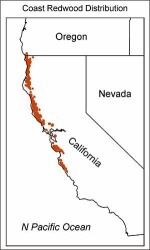 ...Projections of future no-analog communities based on two climate models and two species-distribution-model algorithms indicate that by 2070 over half of California could be occupied by novel assemblages of bird species, implying the potential for dramatic community reshuffling and altered patterns of species interactions. ...Efforts to conserve and manage biodiversity could be substantially improved by considering not just future changes in the distribution of individual species, but including the potential for unprecedented changes in community composition and unanticipated consequences of novel species assemblages.